Jennifer Aniston may be a horrible boss, but she's definitely a really great friend. The 48-year-old superstar turned up on Hollywood Blvd. earlier today to honor her former Horrible Bosses co-star and longtime pal Jason Bateman at his Hollywood Walk of Fame Star Ceremony. The touching and also hilarious speech told of the twosome's long and storied friendship, as well as the many iterations that it, along with Bateman's career, has taken. In the speech, Aniston spoke about the Ozark actor's lengthy time in the spotlight, which began in 1982 with a recurring role on Little House on the Prairie and that, despite all the odds, has continued for more than 35 more years. Speaking of her "partner in crime," the former Friends star said, "One thing has proven itself to be true and that is having longevity in this business is not easy. Especially starting out as a child actor. Usually that's a story that doesn't always end well." She then joked, "When I actually met Jason it was kind of looking like it could go either way." The always funny Just Go With It star just went with the laughs as she told the crowd about a New Year's ski trip that she went on with the boyish star in which the unruly actor scared the other vacationers with his wild antics. "Picture this: It's New Year's Eve. It's just after midnight and there is a blizzard outside. I hear someone yell, 'Help! Someone Help! Jason. Car. Someone could die.' So we run outside to help him and what we see is, we have two feet of snow, Jason is in a truck fishtailing away down a one-way street hanging with the door wide open, hanging half way out of the car. His foot was out trying to stop the car kind of like Fred Flintstone." She then addressed the actor, "It's still not clear what you were doing, a little foggy right? You don't remember." She added, "Thankfully he outgrew those days of terrifying people." Aniston eventually got to the heart of the matter and that's the family man's big heart (but still added in some friendly jabs). 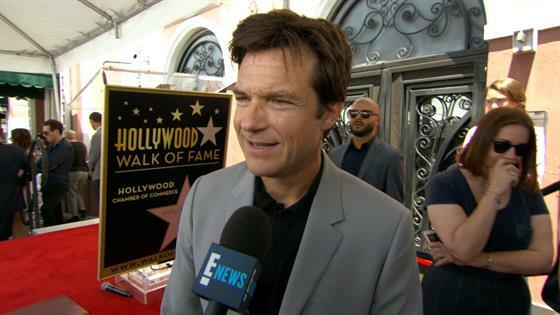 "The part that I'm really the luckiest, that I get to witness as his friend, is Jason Bateman the husband, the fantastic father, the dear friend and as we lovingly call him: Grandpa." She continued, "He looks 12. He acts 100. A head of hair that women envy. He works hard. He's tired. Even in his most restful state, he's one of the loveliest men to be around. He always gives you deep connection, full attention, authenticity and some of the deepest belly laughs that I can remember. We are so very proud of you." Other celebs in attendance were Aniston's husband Justin Theroux and Bateman's Arrested Development co-star Will Arnett.